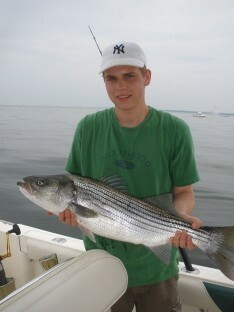 Free Fishing Reports > Northeast > New York > North Shore > Team Fante Bangs Up Striped Bass! This Afternoons trip with Peter and Conner Fante and Uncle Al was a repeat of the AM trip. The crew limited out in no time , with fish to 25 lbs. 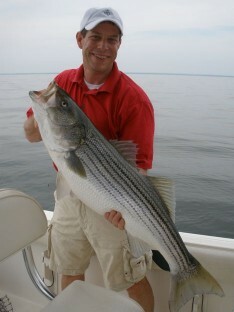 Almost 2 dozen fish were caught jigging with light tackle as well as trolling! 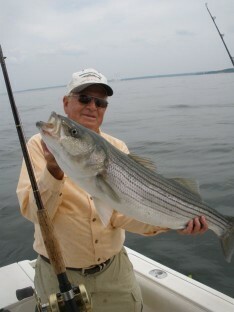 Peter was high hook with the big fish of the day, while the others weren’t far behind! It was a beautiful night to be on the water,( sunny, calm seas, slamming fish)! WOW! 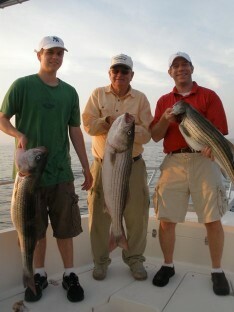 Conner, Uncle Al, and Peter with catch!